The Andaz Maui at Wailea is a stunning luxury hotel along Mokapu Beach in Wailea. The Andaz Maui opened its doors in September 2013 and is Wailea's newest resort. It features cascading infinity pools, a full-service spa and dining experiences food connoisseurs will love. 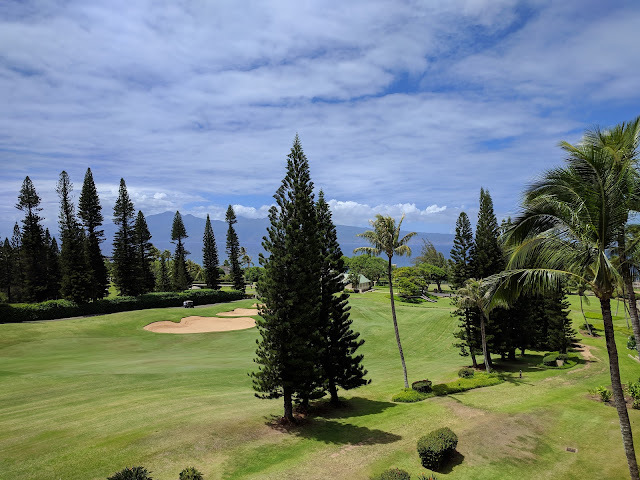 The Wailea area is located south of the Kaanapali Beach resort area and is a luxurious resort community with high-end hotels, condominiums and estately private homes.  Other hotels nearby include the Four Seasons Maui, Grand Hilton Wailea, Fairmont Kea Lani and the Wailea Beach Marriott Resort. If you are not familiar with the Andaz brand, all you will need to really know is that it is Hyatt's take on luxury boutique hotels offering sophisticated style and locally inspired cuisine, i.e., an aura of exclusivity, super cool and super chic hotels in iconic locations around the world. 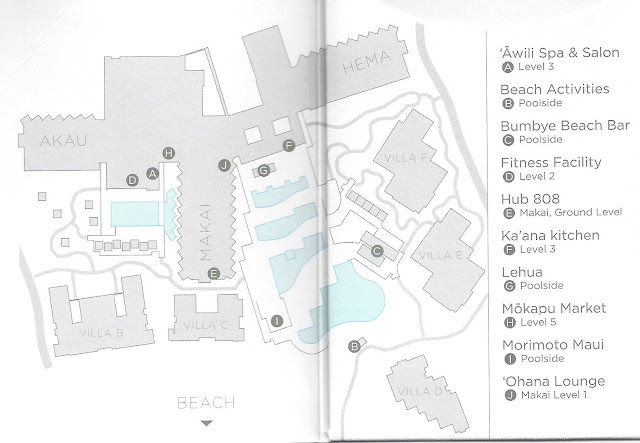 The Andaz has a fairly compact layout when compared to other resorts in Maui and finding your way around is pretty easy. From check-in to when we left, the overall service from the Andaz staff was impeccable. When arriving, you'll find that the only parking option available is through valet, which will cost you $30 per night. There is no self-parking option available here. After getting your car and luggage situated at valet, you'll be welcomed with a lei or shell necklace and then greeted by an associate as you make your way down the beautiful walkway towards the lobby to check-in. Checking in to the Andaz is very different from a typical hotel, as you'll relax and take a seat, as the associate checks you in on a tablet. You'll be offered lavendar lemonade and will be given a rundown of all of the features and general layout of the Andaz. The whole check-in process is very efficient and made to be more personal. 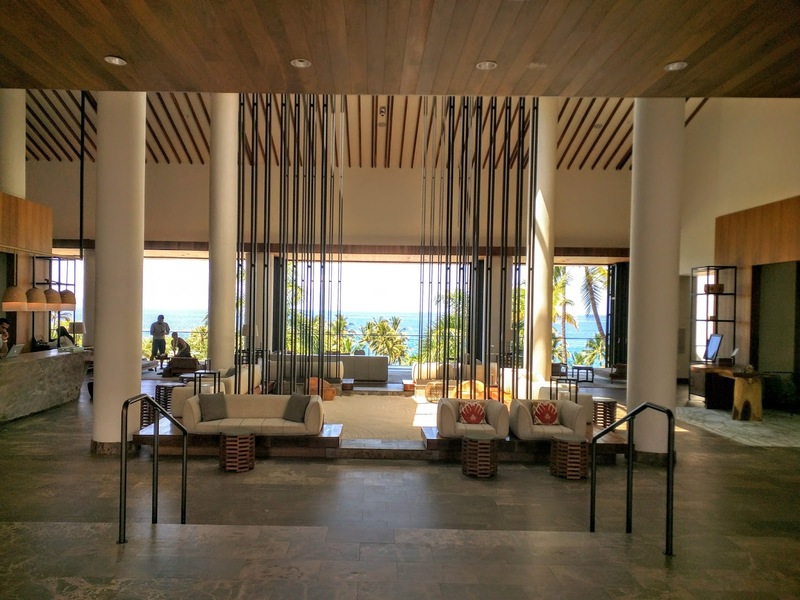 The lobby area is located on the fifth floor of the resort and overlooks the cascading infinity pools and offers awesome ocean views. The entire lobby area decor is completely minimalist and overall very impressive. 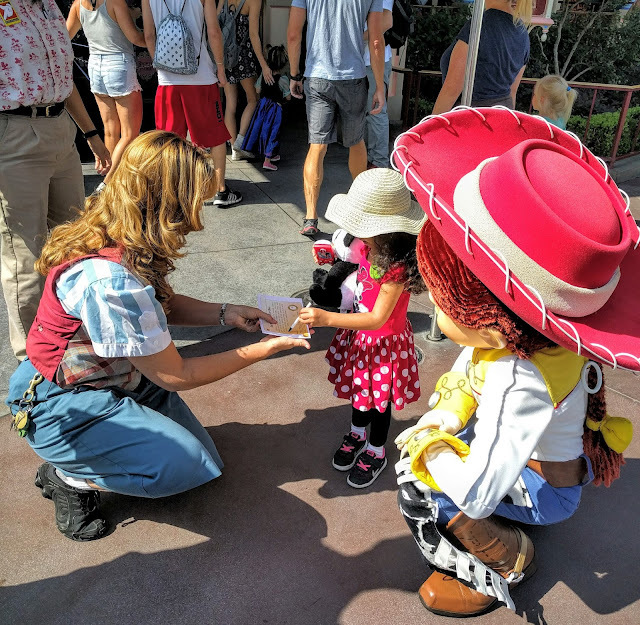 The concierge desk is also located on the lobby level and concierge can help you with anything from dinner reservations, activities and any questions you may have. The Andaz also offers a shuttle service within Wailea that includes drop-off and pickup that may come in handy. 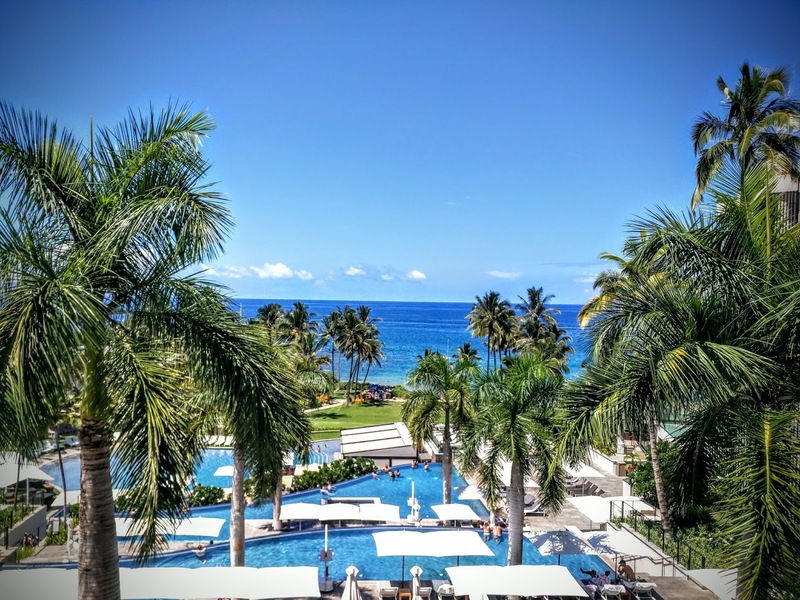 The resort sits oceanfront and offers spectacular ocean views from the lobby level and locations throughout the property. It also has one of the best pool areas I've ever seen. The series of three cascading infinity pools leads down to a larger pool and lounge area. During our stay the pool at the very bottom is where kids spent most of their time swimming. Also note that flotation devices for kids aren't allowed in the three upper infinity pools. I assume this is for safety reasons, as they wouldn't want a child floating over the top of the infinity pool. 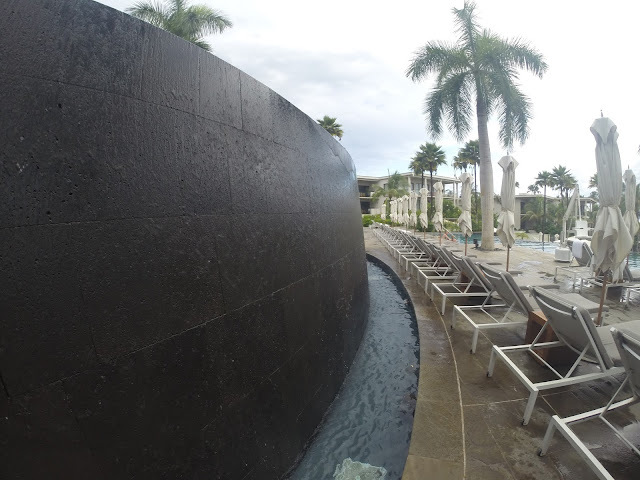 There is a separate adults only pool area on the opposite side of the Makai wing. 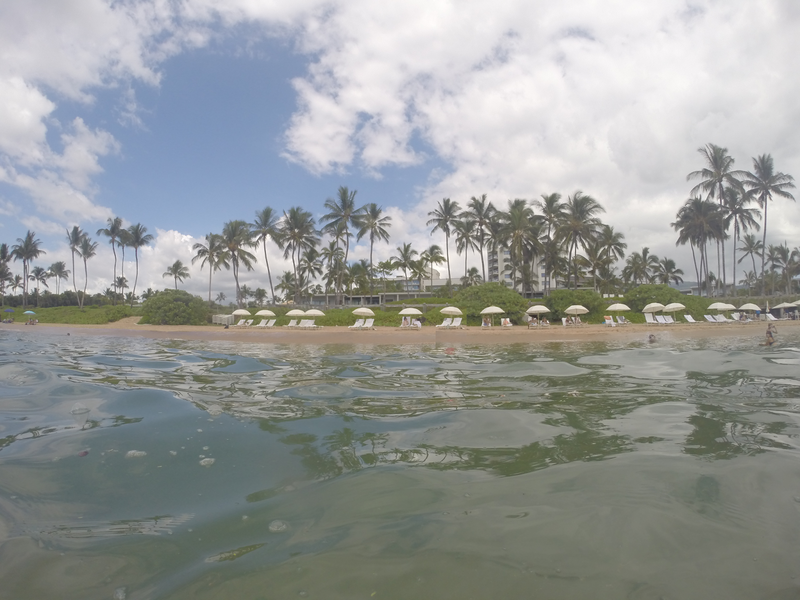 The beach access in front of the Andaz is superb and during our stay the water was calm and perfect for ocean swimming. On the way down to the beach you'll pass by the Andaz Beach Crew kiosk, where you can schedule activities and get help with anything you'll need down on the beach. They will also help get you situated with towels, an umbrella and chairs if you plan on hanging out on the beach for a while. During our stay, we didn't take advantage of the onsite spa, the Awili Spa and Salon, but we did stop by to take a quick look at the spa area and it looked very nice and relaxing. There is a 24-hour gym at the Andaz and also an "Ohana Lounge", which is good for guests arriving before check-in or for late departures. In addition to the hotel rooms, the Andaz also offers villa rentals, shown below. There are five onsite dining options at the Andaz and we were able to try them all. Ka'ana Kitchen: Farm to Table style restaurant open for breakfast and dinner. It is located on the fourth floor, one floor under the lobby level. The cuisine features local and seasonal ingredients sourced locally from Ka'ana Farms and Maui. You can sit inside or outside on the patio and take in pool and ocean views during your meal. As Diamond members, we received free buffet breakfast, which did not disappoint. Anything you can imagine having for breakfast is available and the sheer amount of selection is almost unbelievable. We also came to Ka'ana Kitchen for dinner one night and all of the appetizers and entrees we had were very good and tasted fresh. Morimoto Maui: The restaurant is named after highly acclaimed celebrity chef Masaharu Morimoto, who is best known for Iron Chef and Iron Chef America. The food here is also locally sourced and features fresh ingredients with a fusion blend of Western and Japanese food. The feature of this restaurant is the sushi bar showcasing the best hand rolled sushi and sashimi sourced from fresh local fish from Maui. This restaurant is located poolside on the lower level and is open for lunch and dinner. Bumbye Beach Bar: Next to the lower level pool area featuring casual fare dining and drinks for lunch and afternoon snacks. Lehua Lounge: Located at the upper cascading pool deck and offers great views of the ocean. 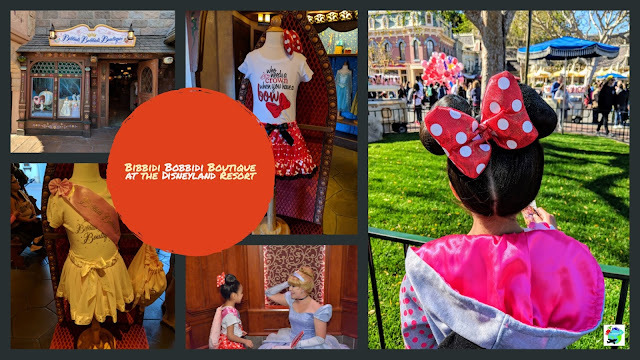 Also features live entertainment and music. Menu items here offer drinks and small bites of farm-to-table style food. Mokapu Market: Located just past the lobby area and is open 24 hours and good for snacks, pre-prepared food, drinks to go, gelato and small gifts. 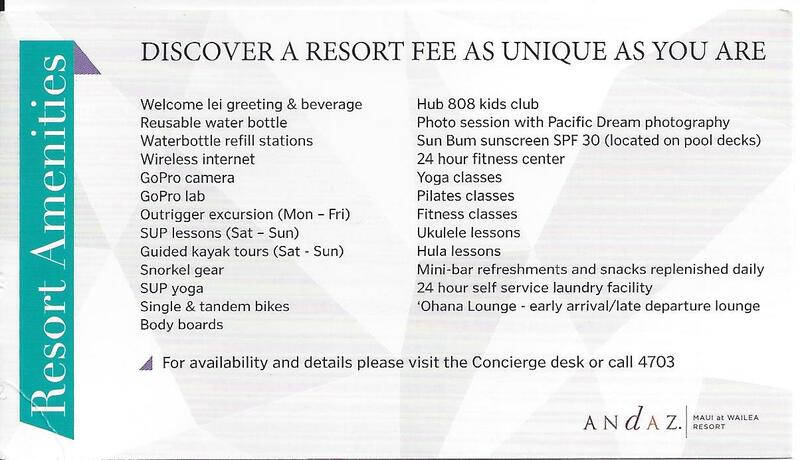 Andaz Activities: The Andaz concierge or Andaz Beach crew can help get you set up with snorkeling, paddle boarding, surfing, ukelele lessons or anything else offered onsite or nearby. A sample of the activities they had going on during our stay is shown below. The Shops at Wailea: The Shops at Wailea is home to 70 shops, boutiques, restaurants and galleries. 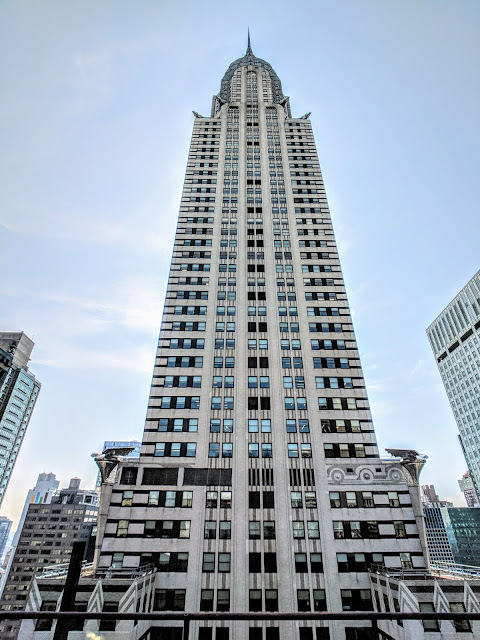 It isn't located onsite, but is only a 10 minute walk away from the Andaz, either along the street or along the beach walk. A small supermarket is opening soon there as well, facing the parking lot and not inside the open-air mall. The Andaz Maui has been featured in Conde Nast Traveler's "2014 Hot List" and Travel+Leisure's "It List for 2014". From the overall decor, cascading infinity pools, dining experiences and overall service, it is not hard to see why it is featured on numerous top resort lists based on our experience here. Overall we had a great time here and plan on coming back the next time we visit Maui. The service here is exceptional and kind of expected I guess given the high room rates and other valet and resort fee charges. Even with high room rates and the additional charges, the resort is very popular and in high demand, as it is fairly new and on Maui. 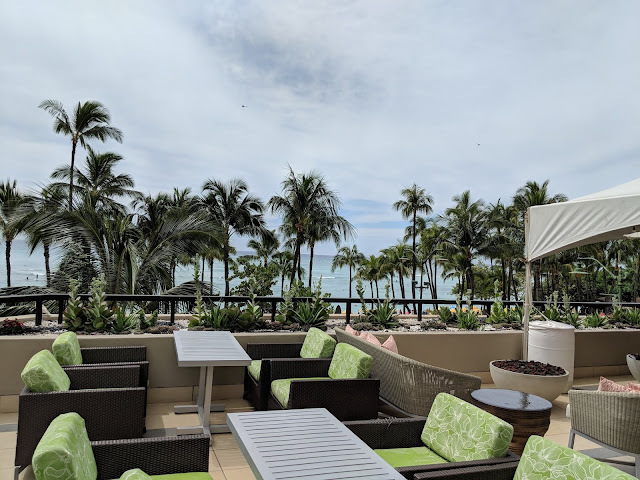 If you're a frequent reader of Flyertalk you'll know the blogosphere has taken issue sometimes about Hyatt Gold Passport benefits at this property and the availability of "award nights" and "points + cash" availability. Award nights and Points+Cash rates help lessen the sting of the high room rates here. I am assuming based on the feedback they've seen, the Andaz now spells out clearly the benefits afforded to its loyalty members and is more up front now on its website. 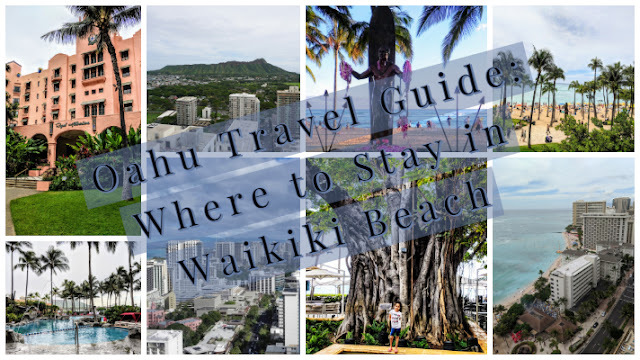 You can read about it on Andaz Maui's website here. 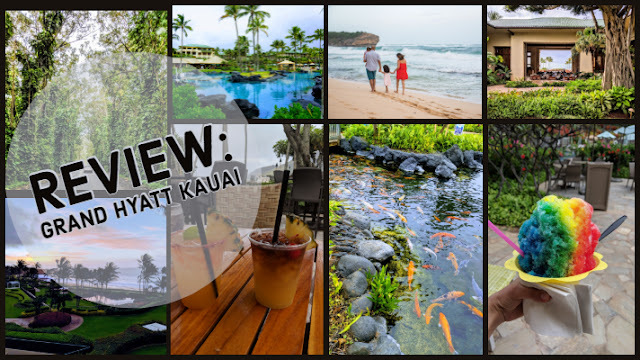 I had previously visited an Andaz hotel, the Andaz in Napa, and kind of knew what to expect with the brand, but since it was our first time at the Andaz Maui, I didn't want to pay the high room rates and figured it would be a good use of my two free night awards I received for getting the Chase Hyatt Credit Card, which I detailed in a previous post you can read about here. You can save some serious money and get great value on your next family trip by getting the credit card. 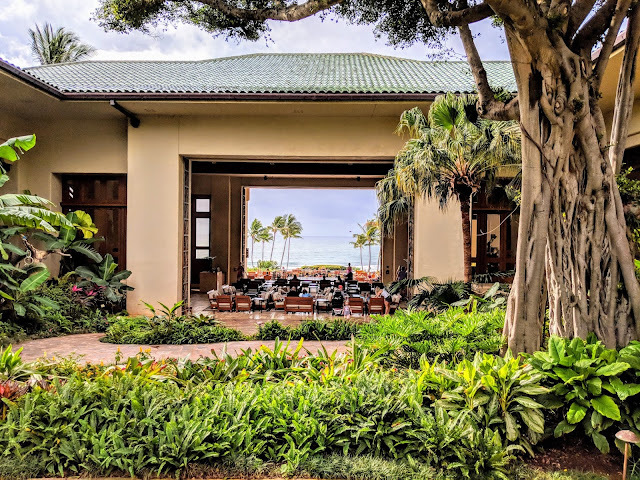 This benefit provided an approximate $900 - $1,200 value in savings, as a partial ocean view room goes anywhere from $450 - $600 in September at the Andaz Maui. Based on my experience, I didn't have any trouble redeeming my two free night awards here. Award nights book into the base room here, which is a Garden View room. I was hoping we could get upgraded to a room with a view, but wasn't expecting it going in. Diamond member upgrade at check-in is based on availability and we were upgraded to a partial ocean view room on the sixth floor which was nice and unexpected. For our diamond welcome amenity, we selected wine, guava juice and chocolate. Another thing to note is that if your stay is booked using award nights, there is no $40 resort charge applied to your stay. For our partial ocean view room on the sixth floor, the room was laid out nicely. Everything is very functional in how it is laid out in the room and the decor of the rooms is styled in a very simple minimalist way. If you are looking to visit the Andaz Maui at Wailea and are looking to save money, I would recommend looking into the Hyatt Credit Card for the two free nights benefit or checking out my previous review of the Hyatt Regency Maui and tips I mentioned in the summary to try to get the most value out of your future vacation in Maui.